“Smoke Detector Saves Family of Seven,” “Crash Survivors Wore Seatbelts” the headlines read. It's heartwarming when we learn of people whose lives were saved by taking simple measures such as changing the batteries in their smoke detector during daylight savings time or buckling up. Sadly though, the newspapers more often are filled with accounts of lives and livelihoods lost to crime and acts of violence that could have been prevented had their victims taken common-sense measures to avoid becoming targets. We don't think twice about routinely changing batteries or having our car inspected because we know that our safety is at stake. Likewise, we should make yearly review of our crime prevention and safety programs a routine. October is Crime Prevention Month—the perfect time for Neighborhood Watch groups to step back and review their programs, update training, and promote awareness within their communities. Not sure how to begin? Two experienced Neighborhood Watch leaders have offered to share their expertise by providing tips that readers can use to revamp their existing crime prevention programs, or to launch a new program. Retired defense contractor Bill Boyd helped found the Eastham, Massachusetts , Neighborhood Watch in January 2004 and currently develops the group's training materials. Alan Slagle, formerly a deputy of the City of Bristol, Virginia, Sheriff's Office, now works as a crime prevention consultant. Eastham , Massachusetts , has a long—make that very long—history of neighborhood crime prevention. In 1620, a group of local Nauset Indians, remembering an earlier attack by English slave-traders, showered a Pilgrim hunting party with arrows as a warning not to cause trouble. Today, Eastham is home to a tight-knit community of some 5,500 permanent residents. The population swells to 20,000 during summer months, when tourists and seasonal residents flock to enjoy Cape Cod 's beaches and historic attractions. The Eastham Neighborhood Watch was founded after Barnstable County Deputy Sheriff Dave Vieira presented the Watch concept at a Council on Aging meeting. From the original 25 attendees who signed up for information about Neighborhood Watch, the program has grown to include one field coordinator, 90 block captains, a five-person membership committee, 20 to 22 weekly volunteers, and four staff members from the police department who provide administrative support. Eastham Police Chief Richard Hedlund has provided the group an office and meeting facilities located in the police station. Today, Eastham is divided into eight regions, 40 percent of which are presently covered by the block captains—and the program is expanding. 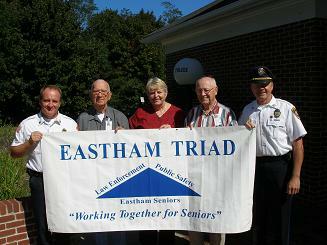 Nearly 900 miles south of Eastham lies another vibrant community with a strong commitment to crime prevention. The City of Bristol straddles the Virginia-Tennessee border. Nestled between the Appalachian and Great Smoky Mountains , this town of 17,400 attracts outdoors enthusiasts and other tourists year round. American Demographics magazine named Bristol one of the best places in America to live because it offers affordable housing, excellent community services, and abundant recreational opportunities. Consequently, the city has experienced steady population growth in recent years, especially among retirees. Despite this expansion, the crime rate in Bristol remains the tenth lowest in the nation thanks to effective law enforcement and Neighborhood Watch. 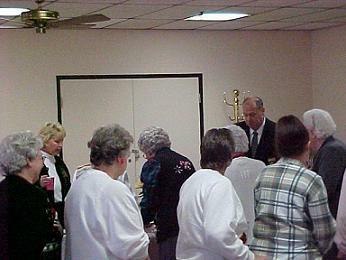 Residents of Leisure Park Towers , an independent living community for senior citizens in Bristol , formed the city's first Neighborhood Watch in 2000, following a spate of petty crimes and suspicious activities taking place near the complex. Today, Bristol is home to 16 Neighborhood Watch programs and, in 2002, the city became the state's third Virginia Department of Criminal Justice Services-certified Crime Prevention Community. Seniors also come from diverse professional backgrounds and most are willing to share their expertise. In Eastham, where more than half the permanent population is retired, residents include former nurses, teachers, business people, a minister, and government employees. The Eastham Neighborhood Watch has capitalized on the senior community's expertise in ways that have allowed it to expand the types of services it provides. For example, one of the block captains, who retired as a Coast Guard officer, now coordinates activities of the Neighborhood Watch's Cape Cod Waterway Watch. In Eastham, retiree Russ Moore heads up his group's membership recruitment efforts. Moore 's vast experience on the Council on Aging and his extensive contacts have contributed to expansion of the Eastham Neighborhood Watch. Seniors can also serve Neighborhood Watch as valuable liaisons to other crime prevention organizations, namely TRIAD, a partnership of law enforcement, senior citizens, and community groups that is dedicated to promoting senior safety. TRIAD members can provide important information on crimes affecting their members such as telephone fraud and elder abuse. “TRIAD and Neighborhood Watch complement each other,” said Slagle. “It's a perfect mix.” It so happens that the resident manager of Leisure Park Towers, Donna Chappell, was serving as chair of the TRIAD senior advisory council when the decision to start a Neighborhood Watch was made. Chappell now is block captain of Leisure Park Towers , and the 20 to 25 residents who volunteer for Neighborhood Watch also participate in TRIAD. Experience in TRIAD has led the group to expand its services to include a mail solicitation program. Additionally, the Leisure Park Towers Neighborhood Watch recently helped another area senior residence, the Douglass Senior Apartments, to organize its own Neighborhood Watch program. To learn more about TRIAD, visit http://www.nationaltriad.org/ or call (703) 836-7827. The federal government can also prove to be a valuable partner to Neighborhood Watch. A prime example is the aforementioned Cape Cod Waterway Watch program, which is sponsored by the U.S. Coast Guard. Eastham is bounded on one side by a national seashore, a popular recreation spot for boaters and swimmers. The Eastham Neighborhood Watch produces and distributes brochures, available at all docks, that discuss watercraft safety and explain the town's mandatory watercraft registration process. Although the Coast Guard is responsible for actual rescues, the Waterway Watch comprises a network of coastal residents who are alerted when a water-related incident is reported to law enforcement. “Often, a resident on the lookout can provide valuable information to rescue personnel before the helicopter arrives on scene,” Boyd said. The government is also an excellent source of free, readily available materials that Neighborhood Watch groups can use to improve both their crime prevention and hometown security programs. Deputy Vieira stresses the importance of Neighborhood Watch taking an “all-hazards” approach. “Groups should look at emergency preparedness, not just crime prevention,” he noted. “They go hand-in-hand for hometown security.” Vieira suggests sponsoring a Ready program from the Department of Homeland Security office (www.ready.gov) to help community members prepare for emergencies and natural disasters. Contacting law enforcement is a logical first step for every new Neighborhood Watch, but it should not be the last. One of Boyd's first contacts was with the town assessor, who drew up a new town map to replace the outdated one then being used. When the Eastham Neighborhood Watch conducts emergency response training, a nurse volunteer is on hand to instruct and advise participants on proper first aid procedures. Monthly meetings are an excellent venue for bringing in speakers from diverse backgrounds. Past speakers at the Eastham Neighborhood Watch meetings have included the Boston director of homeland security and a former Secret Service official. At Leisure Park Towers , crime prevention officers from the sheriff's office and police department work with the resident manager/block captain to set up meetings, locate speakers, and select relevant topics. Step 1. Recruit neighbors. Check. Step 2. Contact local law enforcement. Check. Step 3. Meet to discuss community concerns and develop an action plan. Check. Your budding Neighborhood Watch group can be proud. You've banded together, determined what your community's problems are, and you've got a plan to tackle them. Now it's time to get down to the nitty-gritty, that critical fourth step—training. To help you train effectively, the National Sheriffs' Association (NSA) has introduced a valuable new tool. The Neighborhood Watch Toolkit contains multiple self-paced lessons on important safety-related topics. Contents include CDs, posters, workbooks, as well as specialized training presentations for area coordinators and block captains. October is National Crime Prevention Month—the perfect time for all Neighborhood Watch groups, both fledgling and experienced, to hone their crime prevention skills. Contact the NW training coordinator at info@usaonwatch.org today to request your Neighborhood Watch Toolkit. 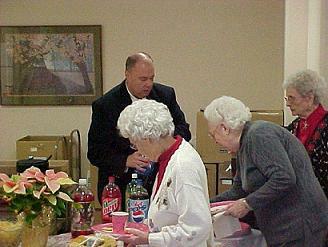 Good communication within a Neighborhood Watch program is vital to its success. “At one point, our Neighborhood Watch was growing so fast that we began to lose touch with one another,” Boyd said, “It was like when General Rommel stretched out his lines of communication too far during World War II.” To fill in its communication gaps, Eastham Neighborhood Watch leaders decided they needed to get more people involved. Today, the group boasts eight regional coordinators and 90 block captains. The group uses a telephone tree system to contact its block captains in cases of emergency. Two to three times a year, Neighborhood Watch participants perform a dry run to ensure that the communication system works effectively. “In 12 minutes' time, we can contact all 90 block captains,” Boyd stated. While investigating these communication problems, the Eastham Neighborhood Watch discovered that law enforcement and public safety personnel sometimes had difficulty locating addresses, especially on the town's many private road. In response, the group has initiated a house numbering program. Furthermore, each block captain receives a notebook with the name, address, and telephone number of every resident living in his or her area of coverage and a map of the area. Codes indicate whether a resident lives there permanently or seasonally, owns a pet, is disabled or uses oxygen, or if anyone in the residence suffers from Alzheimer's disease. 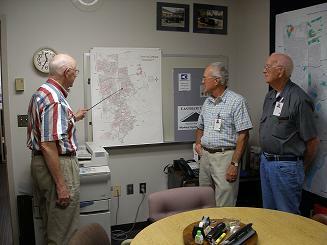 Information sharing creates good will and helps ensure the support of local government. The Eastham group shares its neighborhood notebooks with the police and fire departments. It also opens its meetings and provides copies of its monthly reports to various public organizations, including the Public Access Committee (which deals with issues involving the disabled) and the Council on Aging. While good communication between law enforcement and Neighborhood Watch is essential, the relationship a group has with the community it serves is equally vital. A group should never assume it understands the community's needs and concerns without first talking to its citizens. “Once, during our emergency response training,” Boyd recounted, “an older woman came into the shelter and asked where she could put her dog. We soon realized that she would have left if her pet hadn't been permitted to stay, which could have put her back in harm's way.” Eastham Neighborhood Watch leaders contacted a local dog owner's association and learned that many citizens shared the woman's concerns. The police department is responding by working on a plan to set up an area for pets in the local emergency shelter. Neighborhood Watch groups nationwide share a valuable trait: they are composed of willing, eager volunteers who enjoy spending time together and who share a common goal—prevent crime and keep families, friends, and neighbors safe. This October, remind your members that it is Crime Prevention Month. At your next meeting, listen to your volunteers carefully; they will undoubtedly have many ideas that, when implemented in combination with the tips provided above, will help you improve neighborhood safety and increase community awareness.